Obituary – Redlinger, Steve W. « Perry High School Alumni Association, Inc.
Obituary – Redlinger, Steve W.
Funeral services will be held at 2:30 o’clock Sunday afternoon in the Newton Funeral home chapel for Stephen W. Redlinger, 19, 235 Seventh street, who was killed early Friday morning in a one car accident in Lucien. In the back seat of the car was an automobile racing trophy bearing Redlinger’s name, listing a 1958 Chevrolet and dated Aug. 28, 1960. Rev. Dan Tidwell pastor of the Calvary Baptist church will officiate at the funeral. Burial will be in a Purcell, Oklahoma cemetery. Paulbearers for the servies were announced Saturday. They include Richard May, Steve Bunch, Jack Beckham, Kenneth Johnson, Lorn Dayton, and Merlin Will. 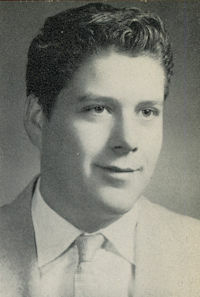 Redlinger moved to Perry in 1957 from Tulsa. Born May 3, 1942, in Webb City, Mo., he graduated in 1960 from Perry high school. Survivors include his father, Ross, of the home; one sister, Mrs. Linda Moore of Hobbs N.M.; and the maternal grandparents, Mr. and Mrs. Omer Wallace of Byars, Oklahoma. His mother, Elsie, preceded him in death.